Traditional celebrations of Saint Nicholas Day, December 6th, include gifts left in children's shoes (the origin of American Christmas stockings). Good children receive treats - candies, cookies, apples and nuts, while naughty children receive switches or lumps of coal. 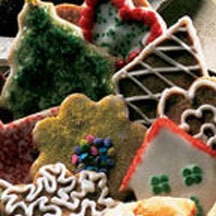 For St. Nicholas Day Cookies: In small bowl, whisk together brown sugar and milk; set aside. In a large bowl or the work bowl of a food processor, whisk together flour, cinnamon, cloves, nutmeg, ginger, baking powder and salt. Cut in butter with pastry blender or drop into feed tube of processor with machine running. Blend until mixture resembles cornmeal. Stir in brown sugar mixture, mixing well. Form dough into two 7x2 inch rolls and wrap in plastic wrap. Refrigerate 6 hours or overnight. Let stand at room temperature for 30 minutes before rolling out. Roll dough out on lightly floured board to 1/8 or 1/4-inch thickness. Dip cookie cutters in flour before cutting out cookies. Place 1 inch apart on ungreased cookie sheets. Bake in 350°F (175°C) oven for about 12 minutes or until cookie edges are lightly browned. Cool on baking sheet 1 minute and then transfer to wire racks. Cool and decorate with favorite icing or royal icing. For Royal Icing: Combine all ingredients in a small mixing bowl and beat until smooth. Frost cookies an dry on wire rack before packaging.